For the astrological concept, see Rāshi . Shlomo Yitzhaki, better known by the acronym Rashi (Rabbi Shlomo Yitzhaki), (February 22, 1040 – July 13, 1105), was a medieval French rabbi famed as the author of the first comprehensive commentary on the Talmud, as well as a comprehensive commentary on the Tanakh . Acclaimed for his ability to present the basic meaning of the text in a concise yet lucid fashion, Rashi appeals to both learned scholars and beginning students, and his works remain a centerpiece of contemporary Jewish study. His commentary on the Talmud, which covers nearly all of the Babylonian Talmud (a total of 30 tractates), has been included in every edition of the Talmud since its first printing by Daniel Bomberg in the 1520s. His commentary on Tanakh — especially his commentary on the Chumash ("Five Books of Moses") — is an indispensable aid to students both young and old. Rashi's surname Yitzhaki derives from his father's name, Yitzhak. The acronym is sometimes also fancifully expanded as Rabban Shel Yisrael (Teacher of Israel), or as Rabbenu SheYichyeh (Our Rabbi, may he live). Rashi was an only child born at Troyes , Champagne, in northern France. His mother's brother was Simon the Elder, Rabbi of Mainz . On his father's side, Rashi has been claimed to be a 33rd-generation descendant of Yochanan Hasandlar, who was a fourth-generation descendant of Gamaliel the Elder, who was reputedly descended from the royal house of King David. In his voluminous writings, Rashi himself made no such claim at all. The main early rabbinical source about his ancestry, Responsum No. 29 by Solomon Luria, makes no such claim either. Legend also states that the couple moved to Worms while Rashi's mother was expecting. As she walked down one of the narrow streets in the Jewish quarter, she was imperiled by two oncoming carriages. She turned and pressed herself against a wall, which opened to receive her. This miraculous niche is still visible in the wall of the Rashi Shul. According to tradition, Rashi was first brought to learn Torah by his father on Shavuot day at the age of five. His father was his main Torah teacher until his death when Rashi was still a youth. At the age of 17 he married and soon after went to learn in the yeshiva of Rabbi Yaakov ben Yakar in Worms, returning to his wife three times yearly, for the Days of Awe, Passover and Shavuot. When Rabbi Yaakov died in 1064, Rashi continued learning in Worms for another year in the yeshiva of his relative, Rabbi Isaac ben Eliezer Halevi, who was also chief rabbi of Worms. Then he moved to Mainz , where he studied under another of his relatives, Rabbi Isaac ben Judah, the rabbinic head of Mainz and one of the leading sages of the Lorraine region straddling France and Germany. He returned to Troyes at the age of 25, after which time his mother died, and he was asked to join the Troyes Beth din (rabbinical court). He also began answering halakhic questions. Upon the death of the head of the Beth din, Rabbi Zerach ben Abraham, Rashi assumed the court's leadership and answered hundreds of halakhic queries. In around 1070 he founded a yeshiva which attracted many disciples. It is thought by some that Rashi earned his living as a vintner since Rashi shows an extensive knowledge of its utensils and process, but there is no evidence for this. Although there are many legends about his travels, Rashi likely never went further than from the Seine to the Rhine ; the utmost limit of his travels were the yeshivas of Lorraine. Rashi died on July 13, 1105 (Tammuz 29, 4865) aged 65. He was buried in Troyes. The approximate location of the cemetery in which he was buried was recorded in Seder Hadoros, but over time the location of the cemetery was forgotten. A number of years ago, a Sorbonne professor discovered an ancient map depicting the site of the cemetery, which now lay under an open square in the city of Troyes. After this discovery, French Jews erected a large monument in the center of the square—a large, black and white globe featuring a prominent Hebrew letter, Shin (ש) (presumably for "Shlomo", Rashi's name). The granite base of the monument is engraved: Rabbi Shlomo Yitzchaki — Commentator and Guide. Rashi had no sons, but his three daughters, Yocheved, Miriam and Rachel, all married Talmudic scholars. Legends exist that Rashi's daughters put on tefillin. While some women in medieval Ashkenaz did wear tefillin, there is no evidence that Rashi's daughters did so. Yocheved married Meir ben Shmuel; their four sons were: Shmuel (Rashbam) (b. 1080), Yitzchak (Rivam) (b. 1090), Jacob (Rabbeinu Tam) (b. 1100), and Shlomo the Grammarian, who were among the most prolific of the Baalei Tosafos, leading rabbinic authorities who wrote critical and explanatory glosses on the Talmud which appear opposite Rashi's commentary on every page of the Talmud. Yocheved's daughter, Chanah, was a teacher of laws and customs relevant to women. Rashi's second daughter Miriam married Judah ben Nathan; their daughter, Alvina, was a learned woman whose customs served as the basis for later halakhic decisions. Their son Yom Tov later moved to Paris and headed a yeshiva there, along with his brothers Shimson and Eliezer. Rashi's youngest daughter, Rachel, married (and divorced) Eliezer ben Shemiah. Rashi's commentary on the Tanakh — and especially his commentary on the Chumash — is the essential companion for any study at any level, beginning, intermediate and advanced. Drawing on the breadth of Midrashic, Talmudic and Aggadic literature (including literature that is no longer extant), as well as his knowledge of grammar, halakhah, and how things work, Rashi clarifies the "simple" meaning of the text so that a bright child of five could understand it. At the same time, his commentary forms the foundation for some of the most profound legal analysis and mystical discourses that came after it. Scholars debate why Rashi chose a particular Midrash to illustrate a point, or why he used certain words and phrases and not others. Rabbi Shneur Zalman of Liadi wrote that “Rashi’s commentary on Torah is the ‘wine of Torah’. It opens the heart and uncovers one’s essential love and fear of G-d."
Today, tens of thousands of men, women and children study "Chumash with Rashi" as they review the Torah portion to be read in synagogue on the upcoming Shabbat. According to halakha, a man may even study the Rashi on each Torah verse in fulfillment of the requirement to review the Parsha twice with Targum (which normally refers to Targum Onkelos) This practice is called in Hebrew: "Shnaim Mikrah V'echad Targum". Since its publication, Rashi's commentary on the Torah is standard in almost all Chumashim produced within the Orthodox Jewish community. Rashi wrote the first comprehensive commentary on the Talmud. Rashi's commentary, drawing on his knowledge of the entire contents of the Talmud, attempts to provide a full explanation of the words and of the logical structure of each Talmudic passage. Unlike other commentators, Rashi does not paraphrase or exclude any part of the text, but elucidates phrase by phrase. Often he provides punctuation in the unpunctuated text, explaining, for example, "This is a question"; "He says this in surprise," "He repeats this in agreement," etc. Rashi exerted a decisive influence on establishing the correct text of the Talmud. Up to and including his age, texts of each Talmudic tractate were copied by hand and circulated in yeshivas. Errors often crept in: sometimes a copyist would switch words around, and other times incorporate a student's marginal notes into the main text. Because of the large number of merchant-scholars who came from throughout the Jewish world to attend the great fairs in Troyes, Rashi was able to compare different manuscripts and readings in Tosefta, Jerusalem Talmud, Midrash, Targum, and the writings of the Geonim, and determine which readings should be preferred. However, in his humility, he deferred to scholars who disagreed with him. For example, in Chulin 4a, he comments about a phrase, "We do not read this. But as for those who do, this is the explanation…"
Some of the other printed commentaries which are attributed to Rashi were composed by others, primarily his students. In some commentaries, the text indicates that Rashi died before completing the tractate, and that it was completed by a student. This is true of the tractate Makkot, the concluding portions of which were composed by his son-in-law, Rabbi Judah ben Nathan, and of the tractate Bava Batra, finished (in a more detailed style) by his grandson, the Rashbam. There is a legend that the commentary on Nedarim, which is clearly not his, was actually composed by his daughters. About 300 of Rashi's responsa and halakhic decisions are extant. These responsa were copied and preserved by his students. Siddur Rashi, compiled by an unknown student, also contains Rashi's responsa on prayer. Other compilations include Sefer Hapardes, edited by Rabbi Shemayah, Rashi's student, and Sefer Haoraah, prepared by Rabbi Nathan Hamachiri. Rashi's explanations of the Chumash were also cited extensively in Postillae Perpetuae by Nicholas de Lyra (1292-1340), a French Franciscan, earning that author the name Simius Solomonis ("the ape of Solomon (Shlomo)"). De Lyra's book was consulted in preparing the important early (1611) English translation of the Bible (the King James version). Of note in recent times is Rabbi Menachem Mendel Schneerson's "novel interpretation" of Rashi's commentary, which was delivered in a series of public talks that began in 1964 and continued for over 25 years. 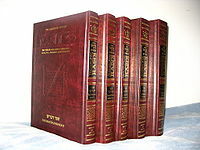 These talks are printed mostly in Likkutei Sichos, and compiled in Hebrew in the 5 volume set of Biurim LePirush Rashi. Schneerson formulated many basic principles for use in interpretation of Rashi's commentary. The semi-cursive typeface in which Rashi's commentaries are printed both in the Talmud and Tanakh is often referred to as "Rashi script." This does not mean that Rashi himself used such a script: the typeface is based on a 15th century Sephardic semi-cursive hand. What would be called "Rashi script" was employed by early Hebrew typographers such as the Soncino family and Daniel Bomberg, a Christian printer in Venice , in their editions of commented texts (such as the Mikraot Gedolot and the Talmud, in which Rashi's commentaries prominently figure) to distinguish the rabbinic commentary from the primary text proper, for which a square typeface was used.